Developed specifically to give an ultra-hard, scratch resistant, heatproof, non-yellowing finish. It is ideal for use on interior wood such as tables, chairs, doors, skirtings, furniture etc. Touch dry in 30 minutes, overcoat after 1 hour. Up to 16 square metres per litre. Coverage will vary depending on the absorbency of the wood. Ensure wood is clean, dry and free from dirt or dust by wiping with a lint free cloth dampened with white spirit, allow to dry before applying varnish. On varnished wood, remove any unsound varnish and sand the surface with medium grade sandpaper well to a uniformed appearance and then clean with white spirit. Allow to dry thoroughly before applying Everbuild Clear Varnish. On bare wood, sand the surface with fine sandpaper. 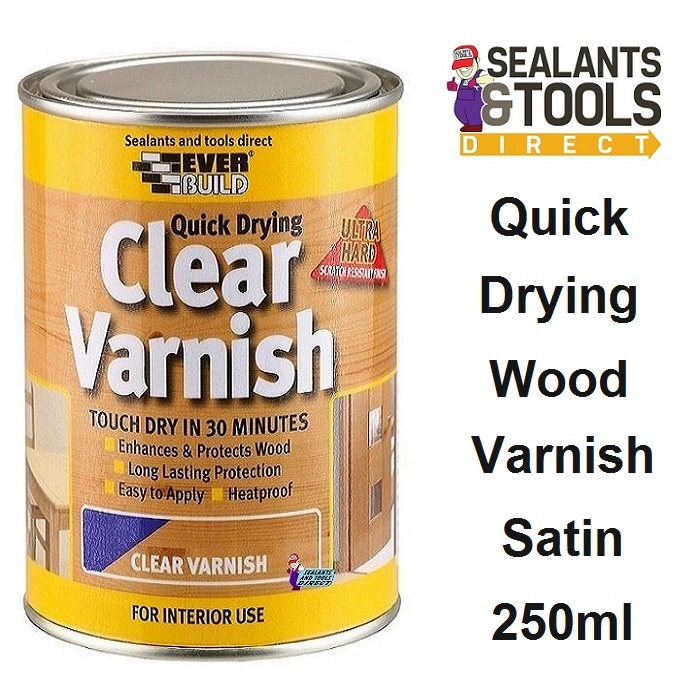 Always remove excess dust with a cloth before applying varnish. Brush apply Everbuild Clear Varnish, following the direction of the wood grain, approximately 2-3 coats will be required for full coverage. It is touch dry in 30 minutes, allow 1 hour in between coats lightly sand the surface before applying the final coat. Always apply the varnish to a wet edge, working systematically across the surface keeping the wet edge moving together as much as possible. Clean brushes thoroughly with water after use, a little washing up liquid will assist brush cleaning. If water is accidently spilt on the surface within 2-3 days of application, remove by wiping gently (do not rub) with a soft cloth. Note: on application, the varnish will appear slightly white; this quickly turns completely clear as the drying process starts.